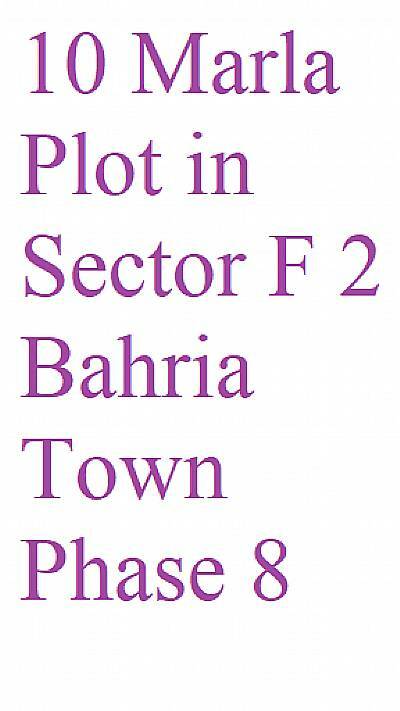 Other Description Golden opportunity for your dream Home , 10 Marla Plots For Sale Right on main boulevard (200 ft wide Bahria expressway ) , Bahria Town Phase-8 Sector F-2 Developed Area , Levelled Plot and Solid Land on Hight , Near Park Very Good location for living or Investment About Sector F-2, Phase 8, Bahria Town Rawalpindi: • Location: Sector F-2 is located adjacent Sector G, Bahria Hamlet, Sector F-1 and Sector P. • Institutes: Dr. Abdul Qadir Khan School and College is located almost 1. 5 km away from Sector F-2. • Commercials: It has its own commercial area while famous Hub Commercial is located at short drive away. • Healthcare: In case of any emergency, Begum Akhtar Rukhsana Memorial Welfare Hospital is located only 1. 5 km away from Sector F-2. • Eateries: Bakers Kraft and Broast & Toast are located in Hub Commercial which is located in close of proximity. • Others: The sector has many small parks and two mosques for offering prayers.